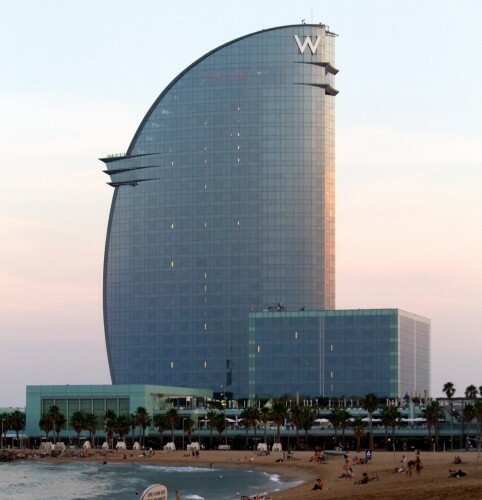 The eye-catching, sail-shaped hotel at the very edge of the Barceloneta neighborhood is where we decided to stay for our 3 nights in Barcelona. The W Barcelona was very luxurious, but felt worlds away from the rest of the city. Price. Expensive. I don’t know the exact dollar/euro amount, but we spent 20k starpoints per night. Looking at prices in May and September of 2013, the lowest level room is €350-415. So, paying with points was definitely the better option for us! 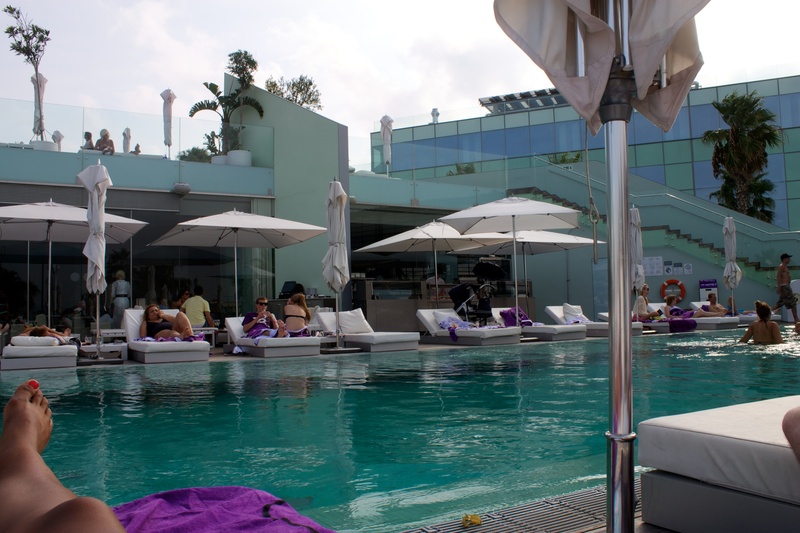 An alternative Starwood hotel is the Le Meridien, which is slightly cheaper and much more conveniently located to most of the attractions and transportation in Barcelona. Location. Right on the beach (there is a direct access from the hotel) and great for relaxing (by the pool). However, other than that, the location wasn’t great for seeing the rest of Barcelona. We felt isolated from everything. It took us around 40 minutes to walk to the Gothic neighborhood, which was our favorite area in the city (next time we’ll look for a hotel there). With the heat and humidity, we wasted a lot of energy walking back and forth between our hotel and it definitely had a toll on the activities we had planned. Room. Gorgeous and comfortable, with a fantastic sea view. The room was set up just the way I like it – the bed was in the middle of the room, facing the bench-to-ceiling windows. And the W beds are so comfortable. Dining. Like most Starwood hotels, the W has food that is readily available and expensive. We were very hungry our first morning in Barcelona and opted to eat at one of the hotel restaurants before heading out for the day. Unfortunately for us, both options were €30 per person, so although we got enough food to hold us over until our late, light lunch, it was more than we wanted to spend. We also enjoyed some drinks and snacks at the bar on the ground floor and at the hotel bar. Again, none of it was well-priced, but you’re paying for the luxurious ambiance (the hotel pool was especially nice, with comfortable benches and tables and lawn chairs by the pool). Private beach access: walking down the steps from the lobby brings guests to the private beach area specifically for W guests. There are towels and lawn chairs available to use (free of charge). Nice pool/lounge area, but fairly impractical for swimming. It was hot (over 90 degrees F) while we were there, but, just like other European pools, the water was so cold that we couldn’t stay in for more than a few minutes without worrying that our heart might stop beating. That being said, we snagged a booth while we ordered snacks and drinks, and then moved to the lawn chairs that sit right in front of the pool, so we definitely enjoyed ourselves. Beautiful area to lounge around at and work on the tan, but not so great if you actually plan on swimming. Gold Check-in Amenity : At check-in, we received the choice of free wifi for the stay (normally 19 euros per night! ), two free drinks, or 250 starpoints. I chose the free wifi, but the man at the desk was super nice and also gave us two free drink certificates (beer, wine, or cava only). A few days after checking out, I signed into my SPG account and realized he also gave us the 250 points! If we could go back in time, I would have chosen a different hotel for this trip. The location was a huge drawback that we didn’t fully anticipate while planning. Taking a taxi everywhere was an option (and that made the distance more bearable), but being able to step out of the hotel and into middle of the city is a benefit we won’t overlook on our next trip. This entry was posted in Hotel Review, Travel and tagged Barcelona, hotel, Portugal/Spain 2012 Trip, Spain by Kristin. Bookmark the permalink.